Oh how clever Kentuckians are with metal. We're proud to represent the best metal artists in the state. 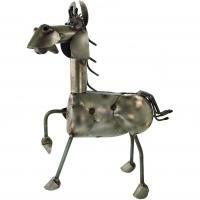 From whimsical to functional, traditional to contemporary, we carry a wide range of metal and outdoor art. Don't see it here? No worries, we have LOTS more in the store. Give us a call or shoot us an email and we'll be glad to find exactly what you want. One of our favorite artists has outdone himself with this beautiful mixed media wall hung sculpture. Hand crafted from ceramic tiles and cut steel, this piece reflects some of the best of the bluegrass... the beauty of our natural heritage. It is ready to hang with a simple heavy duty wire across the back and will make the perfect accent to any home or office. Our favorite best seller, the Dog on a Hog is sleek, stylish and ready for the road! Made from recycled parts (timing chain, reject propane canister, and spoons to name a few). The perfect gift for the dog lover or the "hog" lover on your list! Made in Louisville, KY.
Made from all recycled aluminum pop cans, which provide an amazing array of color and shine to this galloping horse. 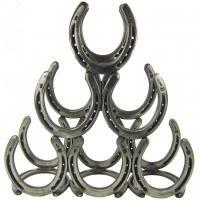 This piece will be the focal point to any room, and is sure to delight the horse lover in your life. Ready to hang. This beautiful "Pretty Peacock" has multi-colored marbles in the tail feathers to add a bright element to the recycled steel construction. This is sure to liven up your garden or porch! Remember that when placed outside, these pieces will patina rather quickly and the bright orange color will deepen to a dark rusty surface within a year. If you want to maintain the silvery color of the steel, it will need to stay inside. 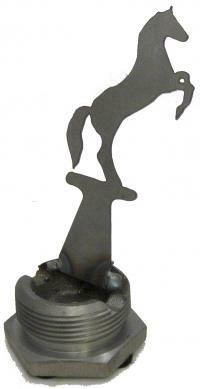 size: 26" x 14" x 22"
This two-dimensional metal sculpture is sure to get a few looks hanging on your wall. It is made of fabricated steel and painted black for a contemporary feel. The artist's humor shines through in this whimsical piece for the person who has everything... we bet they don't have this! size approx: 18" x 24" x 1"
This lively fried chicken is one of our all-time best sellers! Great for collectors of folk art and fried chicken lovers alike. 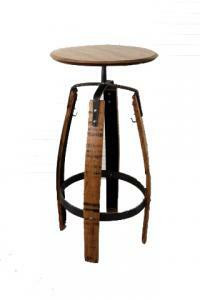 Handcrafted in Kentucky from a cast iron frying pan, rocker arms, and rebar. size: 9" x 14" x 21"
Meet the quietest dog you'll ever own and he doesn't eat much either!! This guy is made from recycled metal "scrap" and will quickly become your best friend. 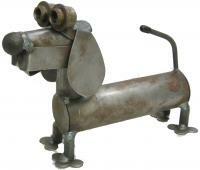 He is a great addition to the dog lover's home or garden. Remember, if you put him outside, he'll develop a deep rusty patina that will just get better with age. size: 7.5" x 10" x 3"
This is one of our favorites and will soon be yours too! This chubby peacock is made from recycled metal including an oversized nut for the body and features colored glass marbles as tail accents. Your friends will LOVE this piece! 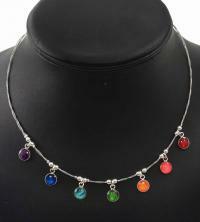 size: 6.5" x 14.5" x 11"
Just in time to gather some rays, this rainbow necklace will brighten your day any season. Each gem is hand-painted and resined for durability on this bright beauty, great for young or mature jewelry connoisseurs. 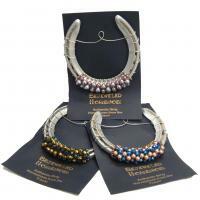 Handcrafted in Frankfort, KY the chain is crafted from steel bead wire accented with sterling beads and closure. It also features an adjustable length for the perfect fit for any wearer. If you would prefer a single color it can be custom made, please include extra time for production and specify color in the Comments section of your order. Dress up any table setting with this mighty rooster salt and pepper holder. Glass shakers are included. These critters are fun, functional and they are created using recycled materials, so they are ecological too! Dress up any table setting with this cute "spring" chicken salt and pepper holder. Glass shakers are included. These critters are fun, functional and they are created using recycled materials, hence the "spring"!! 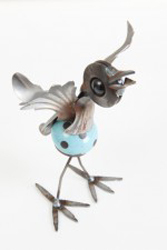 size: 4" x 7" x 7"
Add a bit of whimsy to your home or garden with this adorable mini chick. 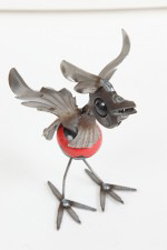 This little guy is made from recycled metal parts from right here in Kentucky. 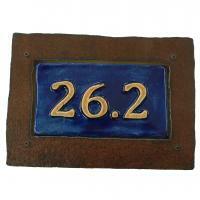 Made to commemorate the exact distance of the first marathon, this plaque is handcrafted in Lexington, KY. The artist creates the ceramic tile and surrounds it with hand cut steel. Those who've trained for a marathon will know exactly what it means. To others, they'll think it a beautiful piece of art. Ready to hang on the wall or to display in a stand, the plaque measures about 6" x 10". Available in a variety of glazes. 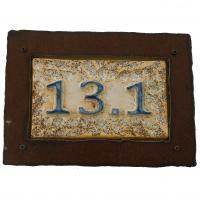 Made to commemorate the distance of the first half marathon, this plaque is handcrafted in Lexington, KY. The artist creates the ceramic tile and surrounds it with hand cut steel. Perfect for that first half marathon runner, and they can strive for the "26.2". This little bad dog would make a funny desk top decoration or table top item and is sure to get a laugh out of knowing dog owners. Why is he a bad boy? Look closely, he's lifting his leg. Made using scrap and recycled metal. This is the little kitty version in the "Nuts" family of critters. She is made from recycled metal parts and an oversized nut for a body. She might not be too cuddly but she sure is cute!! 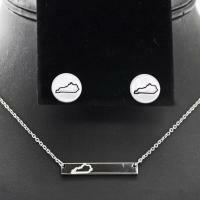 This gorgeous stainless steel necklace is perfect to show your pride and love for the state of Kentucky. Stainless steel is very hypoallergenic and will also not rust or tarnish. You can even wear it in salt water! The length of the necklace is 18". 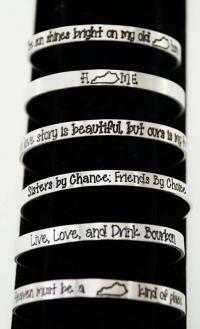 Send them home with a piece that is true Kentucky! 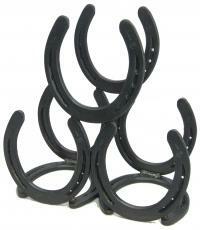 Made from an authentic, forged steel horseshoe, this business card holder is both tough and elegant at the same time. It makes a great speaker gift for John or Julia. 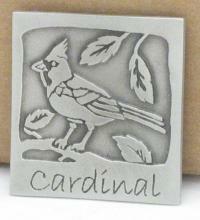 This Kentucky cardinal is a must for sports fans and nature lovers alike. As the state bird, the cardinal is one of the most recognizable of all our feathered friends. He is perfect for your desk, bookshelf or windowsill. Made in Louisville, KY.
We'll bet that the person who has everything doesn't have one of these!! A perfect little piece of Lucky Kentucky; collected from the track-- that's right, they even have a bit of real dirt left in them from the race track! Each is adorned with sparkling beads of assorted colors. Please specify if you'd like a specific color in the Comments section and we will do our best to accommodate your request. Capture your very own hummingbird in flight. This one is anchored by a short stand so it will never be out of sight. Made with marble eyes and a colorful cabinet knob body it will brighten any table or desk top. This sweet little blue bird will bring a song right into your heart! She is made from recycled metal parts and a cabinet knob for the blue body. It is just too cute! These birdies make the best "pets" and are known for their "low maintenance" lifestyles. Made from a solid piece of steel that is literally heated to red hot and then SQUISHED in the power hammer of the blacksmith's shop, this votive holder is no dainty daisy. Each one is one of a kind and looks best surrounded by a few "friends"... in groups of three to five generally, but two can make a nice display also. size approx: 1.5" x 2.5" x 2.5"
This big ant is welcome at every picnic, if he is too big, his little baby ant might be just right for you! They look great in "families" too. Made in Louisville, KY.
Yikes! How can a rattlesnake be so cute? This little rattler is made in Kentucky, USA from recycled metals and bike chain. Perfect for your desk or bookcase!! This business card holder/recipe stand is great for the horse fan in your life... and while in KY... who isn't?? The metal is reclaimed from scrap industries in the Louisville area and is then transformed into creative, functional art. We love the "green" initiative behind this work and of course, we love that it is a horse! This magnet is a lovely expression of our state bird, the cardinal. Crafted in hand-cast pewter, it carries a lovely weight and will adorn any kitchen fridge or file cabinet. This makes a great speaker gift when you need many on a small budget.